Vegetables from Brinkley Farms, a Durham Farmers’ Market vendor. The Durham Farmers’ Market is held year-round at Durham Central Park in downtown. The idea is pretty simple: Local farmers, bakers, and artisans show up every week with tons of locally grown, fresh food and produce. Thousands of Durhamites come to wander through the stalls, make conversation, and stock up on fruits, veggies, and more. But what many people might not know is how many programs and services exist to help people afford the healthy foods they deserve. Market staff Charlotte Minguez can be found at the information table greeting customers in English and Spanish to make sure they feel welcome. SNAP & Double Bucks: The market accepts SNAP/EBT benefits. Just stop by the info table under the Pavilion and a staff member can help you redeem your SNAP dollars for tokens to spend at the market. The best part is that the Double Bucks program will match your SNAP dollars up to $10. So, if you redeem $10 worth of SNAP benefits, you actually get $20 to spend at the market. WIC Farmers’ Market Nutrition Program – FMNP checks are distributed at WIC offices from May to September. Checks can be used at the market to purchase fruits and veggies. Checks are matched 100% with Double Bucks. Senior Farmers’ Market Nutrition – Senior FMNP checks are distributed at Senior center sites in Durham during the summer months. These checks can be used to purchased fruits and veggies at the market. Checks are matched 100% with Double Bucks. Cash Match – the market will match cash for community members that are enrolled in SNAP, WIC, live in public housing, or participate in Section 8 housing programs. Bring cash to the info table and market will match up to $10! Bring a Friend – Bring a friend or family member to the market that will also be participating in one of our food programs and both customers will receive $5 extra to spend at market. These programs are funded through local grants and donations. Major funders include Burts’ Bees Greater Good Foundation and Durham Crop Walk. Have more questions? Learn more about Durham Farmers’ Market food programs here, and get answers to general questions about the market here. 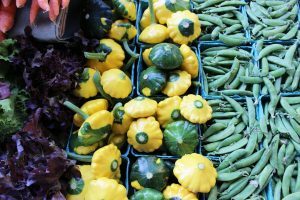 If you are interested in supporting the Durham Farmers’ Market’s programs increase access to healthy food, learn more about volunteering or donating here.